Thompson’s article describes the reaction of the Chicano community in Los Angeles to the controversial death of journalist Rubén Salazar on August 29, 1970, the day of the National Chicano Moratorium protest against the Vietnam War. Police attempted to shut down the rally, and Salazar was fatally struck by a tear gas shell fired by a sheriff’s deputy. 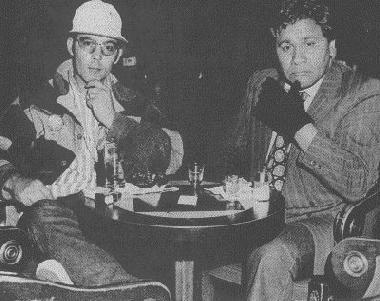 Thompson interviewed attorney Oscar Zeta Acosta for the article, and together they drove to Las Vegas to discuss the case more freely. Acosta (pictured above with Thompson) was the inspiration for “Dr. Gonzo” in Thompson’s Fear and Loathing in Las Vegas. Hunter S. Thompson,”Strange Rumblings in Aztlan,” Rolling Stone #81, April 29, 1971.